Who doesn’t have time for a quick bowl of Maggi noodles? Nobody. 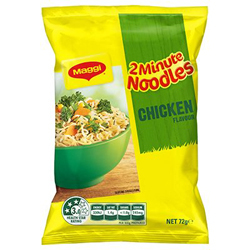 With their famously brief preparation time, Maggi noodles are a tasty, sustaining snack ready in two minutes flat. Or, if you have more time, they make a perfect base for a larger meal like stir-fry or noodle soup. Flavour Mix Sachet: Iodised Salt, Maltodextrin (contains Sulphites), Flavour Enhancers (E621, E635), Flavours (contains Wheat, Soy, Celery and Sulphites), Mineral Salt (E508), Onion Powder (contains Sulphites), Palm Fat (Antioxidant (E320)), Colours (Tumeric, Caramel III) (contains Sulphites), Parsley Flakes, Spices.